Not a plot summary, but random thoughts and questions about the episode. Wow! It’s been a while since I’ve been genuinely shocked by an episode of Doctor Who. I’m getting too old and cynical, probably. But this episode definitely had a few “Wow” moments! First of all…the handmines are totally creepy in the best way possible. I hate things that are outright scary, but these were just the right amount of creepy. The Doctor finds a young boy trapped in a field of these handmines. This kid confused me. At first I thought it was going to be Bors, somehow, since he mentioned in the Prequel that the Doctor had saved his life. 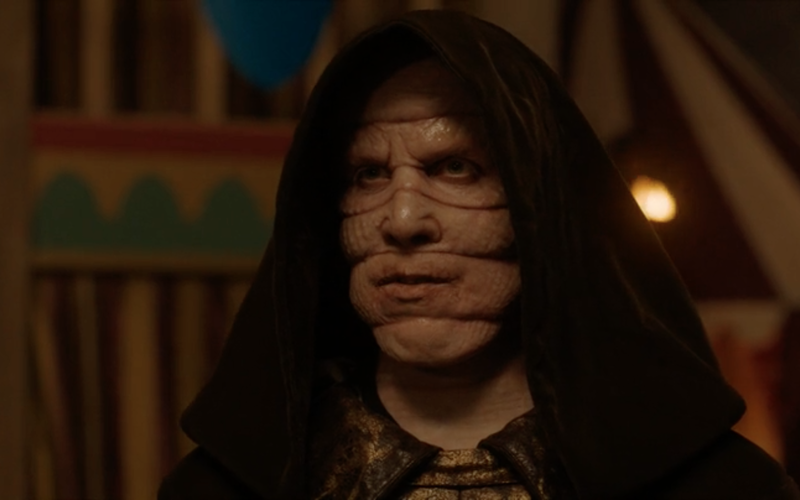 I was not expecting him to be Davros. Wow. I had been staying away from spoilers so this was completely out of the blue for me. The biggest questions I have from this episode revolve around this moment, but I’ll come back to those. I love the new character of Colony Sarff. Democratic snakes – so awesome! Colony Sarff is traveling around looking for the Doctor, and I made mental notes to refresh my memory of the Maldovariam, the Shadow Proclamation, and Karn. Anyway, they find the Doctor in the year 1138 in Essex, entertaining a crowd as a magician. I was not really impressed with the guitar/tank entrance. I dunno, maybe I watched too many previews with the guitar. I was not super entertained, but that’s life. Frankly, I found the Doctor’s antics in the prequel absolutely hilarious and I think that should have been part of the episode instead of the bit with the crowd. I mean, putting off meditation because he needs better water? Flailing around until they finally dig a successful well? Great stuff. It’s funny on the surface but there’s obviously something that the Doctor is very reluctant to face. 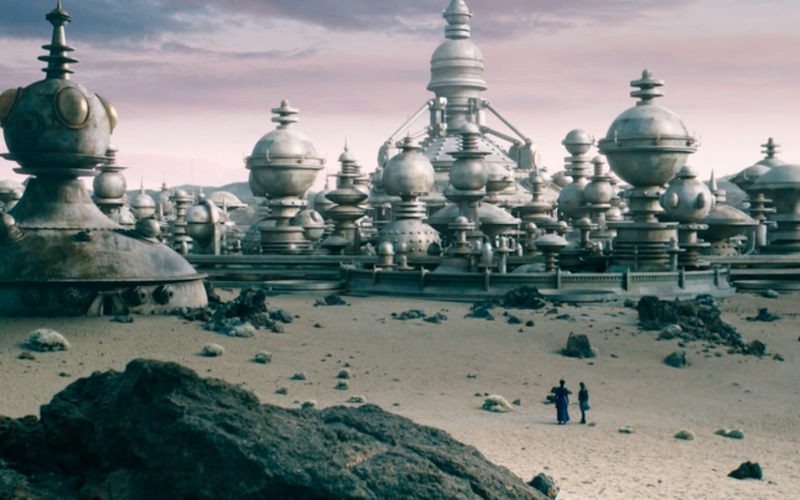 Jumping ahead a bit, I also loved Missy and Clara walking around in the stars, and then the reveal of Skaro. 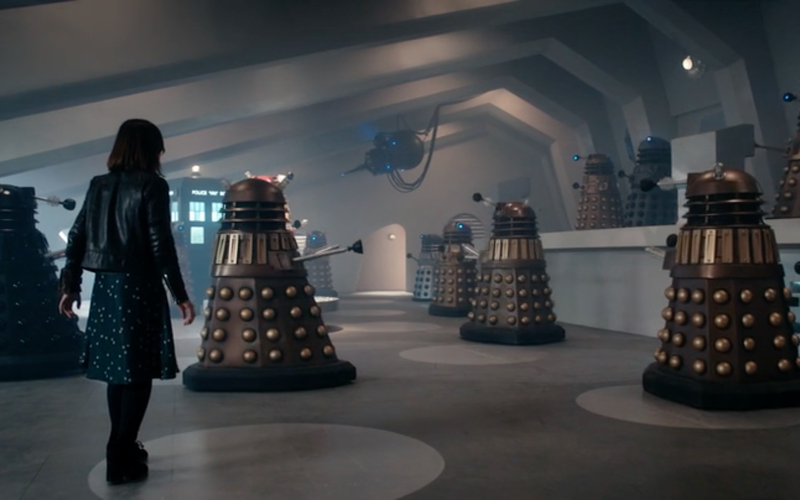 The episode ends with the daleks exterminating Missy and Clara. I’m assuming neither one of them is actually dead, and that the Doctor will fix this in the 2nd part. After watching this episode, I went and watched Genesis of the Daleks. Kat told me to watch it beforehand but I didn’t (sorry, Kat!) But I caught some things I probably would not have noticed otherwise, like a reference to bows and arrows, which we see the soldiers using in The Magician’s Apprentice. The Doctor wrestles with the choice of destroying the daleks, and ultimately can’t bring himself to do it. He believes he has delayed their development for 1000 years, and that should be good enough. 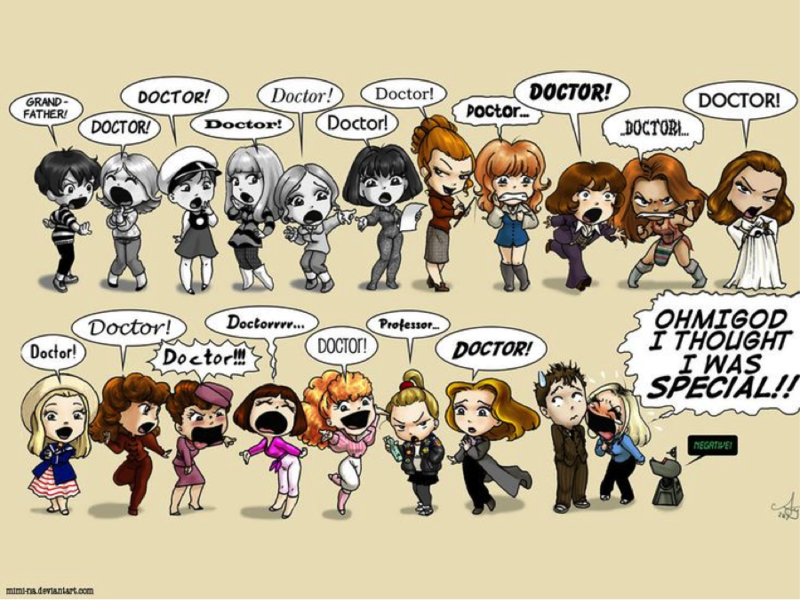 The question now is what the current Doctor will do. He has realized that he can’t run away from the choice forever. I’m thinking he won’t actually exterminate young Davros. That would be very dark for Doctor Who. (Though they did that in Torchwood, where Jack sacrifices not just any child, but his own grandson.) But on the other hand, since his non-choice in Genesis of the Daleks, he’s seen over and over again how much destruction the daleks can bring. Will that change his mind? Knowing the Doctor, he will come up with some clever plan to save the day, save his friends, and possibly rewrite bits of history. How did the Doctor find young Davros in the first place? Did the Tardis take him there? Why exactly is he going to his death? 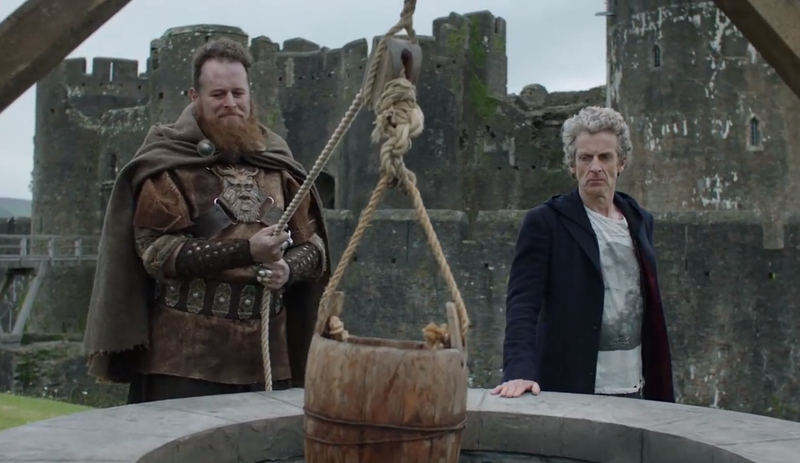 Is he somehow going to die along with Davros? Did I miss something there? This is really bugging me. Paradoxes. If the Doctor couldn’t save Danny because that would be a paradox, then how could he kill Davros? If the daleks never exist, he can’t go back in time to kill Davros, especially not by using dalek technology. Is Danny’s death one of those fixed points in time? Now that Clara and the Doctor are “back together,” how long before he finds out that she lied about Danny? Or worse, how long before she finds out he lied about Gallifrey? I imagine she will be quite angry at him for lying, even though as we all know, the Doctor always lies.